The main theme of this year's PratiPrasav Sadhana and Art of Dying course in Kurukshetra from Babaji was on Pitu Ascension because this holy land is a place where people come from all places for doing the ascension of their ancestors. Along with this Babaji's main theme was SAMETNA meaning to withdraw or gather back our consciousness invested all over places, people, interests, relationships, desires, property, incidents, etc. Babaji said "Sametna shuru kardo" meaning start withdrawing your consciousness from the external things into internal. Here are the precious gems from Babaji during the entire shivir and is given in direct speech (When you read it, you can know that Baba is speaking to you). There was once a man who lived in a very small house. He once went to a sadhu and said that his house is very small and it is difficult for him to live in and to please make his house bigger. Sadhu asked him if he had animals and he said replied he had hens. The sadhu then adviced to keep all hens in the house and not to let them out and asked him to meet him the next week. Next week the man complained that it is now more problematic since the house was full of hens. The sadhu asked what other animals he had and he replied he had goats. The sadhu asked him to take all his goats in and come the next week. Now his house was full of hens and goats. Next week he was very upset and narrated his condition. The sadhu asked if he had any other animals and when the man said he had cows, he asked to fit them in and come back later. The man was upset but scared not to obey the sadhu and thus went back and took the cows also in. After a week, miserable the man went to the sadhu and said now all animals are in and nothing is left out. The sadhu asked him to now let all the animals out and come back next week. Next week when the man went the sadhu asked how he was and he replied "I have a spacious house. There is so much of happiness and comfort!" Babaji narrated this story to compare with the sudden situation in the shivir that arose with 8000 plus people attending. He said "You all also must have come from open spacious houses into this small place. Even in times before when people used to go to any ashram, which were without AC and geyser. So you also think that you have also gone to Baba in some jungle." You have not come alone this time. Your many many ancestors also have come to the land of Kurukshetra and they have come to take the wisdom of Pratiprasav and they have come to get liberated from the different yonis they have gone into, so the wisdom that you are going to get, your ancestors will also get and lakhs of pirtus are going to get liberted here in the holy land of Kurkshetra. People are not comfortable with the name of Pratiprasav sadhana and 'Art of Dying' atleast people do not want to talk about it. But, how birth is true and how life is true, so is also true death. In reality, there is nothing called death. Even Krishna showed his Virat swaroop to Arjuna and asked him to see his Bramharoopa. We think that the bramhaswaroop was only of Krishna's but in reality you all are that virat swaroop but we remain ignorant. Thus we get stuck with pain and sufferings. When you are body conscious, there is lot of sufferings and you say that so and so has given you lot of troubles, my husband was good/bad, parents were good/bad, married life was good/bad and all sorts of miseries with all sorts of worldly connections. This is all body consciousness. But when you are soul conscious, then one cannot be in these troubles or become ill or be troubled or die. Krishna gave Arjuna the same message, "Become soul conscious. Neither were you born nor are you going to die. No weapon can hurt you, no water can melt you, no fire can burn you.. you are immortal. So, whatever Lord Krishna told you in this land of Kurukshetra, I am telling you the same, that you are immortal. People ask me whether to celebrate my birthday. I ask them which birthday? They say YOUR birthday. I say you can never celebrate my birthday, talk about this body. You can celebrate this body's and when the body is left behind then say we are celebrating the punya thithi (death anniversary) and that he was there, he was a good soul and has gone away. I am not going to go anywhere nor have i come from anywhere. I have been here and will be here. So, which birthday? If you want to have fun, food and music do it now, celebrate every day, every moment. Leave the myth aside that somebody dies. Noone dies. After doing pratiprasav you will know that nobody dies. I will not only share this wisdom because Baba believes more in make one experience than talking. What happens during death I will make you experience it, do not fear. It is nothing to fear, it is enjoyable because your consciousness that is spread around will shrink and withdraw and when it withdraws then what remains in you is sat-chit-anand and nothing else. You have experience this ultimate truth and know, not by hearing. There is no bigger punya (merit) than seva (service). Bhajrang bali (Hanuman) kept doing seva and he took the form of God. Seva brings you lots of merits and if you can do Bramhaseva then nothing like it. There can be lot of stress during seva but if you can maintain unconditional love during such times also, then your spiritual growth will be faster. Find opportunities always to do seva every day and you will be blessed. Bhaav or your imagination is very important in the sadhana. I used to tell my guru that so and so happened to me and he used to tell me 'Everything is your bhaav' (imagination) and I used to wonder when I earned something from my sadhana, why does he call it my imagination. But I eventually realized that it is was the imagination of the parents from which I was born. It was the bhaav of my parents through which I was born. It was my bhaav that I should do sadhana and thus I progressed in it. It is true that anyone can imagine butit is knowingly or unknowingly. Even without intentions we imagine. We sit and imagine that that person can cause me harm, this also is imagination. Whatever you think about future is imagination, which is not a reality. So everything is bhaav. But now you have to imagine knowingly but about only what you want in your life. Babaji then asked for gurudakshina which is difficult for a sadhak to give. After taking assurance for everyone Baba said, "I will ask only what is yours because you cannot give what is not yours. If I ask you for money, that money is not yours because sometime back it was someone's and after sometime it will become someone's. If I ask for your physical for seva in the ashram, then this body also is not yours for your parents have given it to you. I am asking for gurudakshina because I am giving you what I have earned so I will ask you only what is yours. I ask of you your biggest weakness, which you have created and have become a slave of that weakness. This is the first thing I ask as gurudakshina. Now, you cannot say I get angry or lazy because that is your weakness and you have now given it to me. Baba asked everyone to imagine ganga water in their open palms and offer it at the guru's feet at least one weakness and if one was a greater donor to leave more weaknesses. The pledge was "I _____ swearing in the name of Lord Krishna in the land of Kurukshetra give my _____ weakness in the form of my gurudakshina at the guru's feet." Second time, Babaji asked everyone to leave their karmas there and not to take it back the karmas but to take back grace from here. Then Babaji said that it is incorrect to take back what you have given because once you give, it then is not yours. What you are thinking is yours, you hold on to it tightly and never want to give it, and what is not yours, you come to give. Thus, holding on to it, the being moves from one life to the other thinking it is his/her priced possession. This is what I want. If you give it whole-heartedly you will start getting liberated. Modern furnitures and sofa are made in odd positions in the name of giving comfort, but this is not comfort. Comfort to the spine is when the spine is straight because when consciousness rises the spine should be erect. This is bramha-gyan which until you do not accept you will not gain. 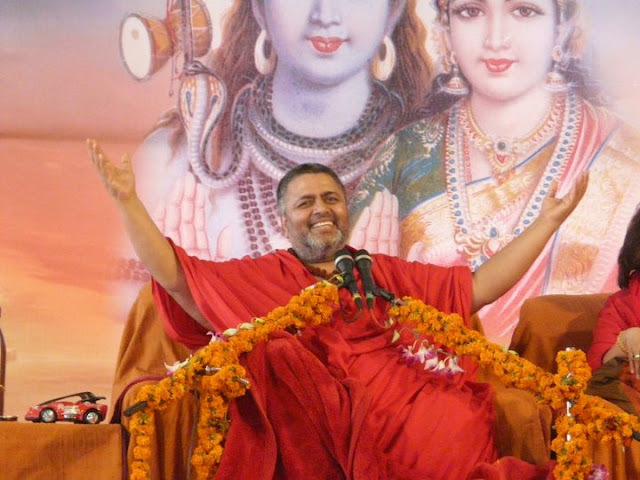 When I entered into the school of ShivYog, the first lesson I was taught was shudh bhavana (pure intentions). Whatever wisdom I give you on Pratiprasav, you will have to go back and do sadhana on it. Everything is created with imagination. Once a woman got her son married and then started imagining on the common saying that the daughter-in-law comes and does tricks and the daughter-in-law started imagining that the mother-in-law will do tricks on her. I asked the mother-in-law how can she think this way and she said that when she wakes up in the morning, she feels lifeless. I told her you have arthritis and show the doctor, what can the daughter-in-law do in this? She continued that when she makes pakodas, they get spoilt and I told her to go to cooking class for that. She was imagining things all the time so much that he husband also started imagining the same that they were being tricked and there the daughter-in-law also was imagining and the whole house was full of tricks. Daughter-in-law left the house and everybody imagined the mother-in-law has done something. Things went to divorce and they got divorced and mother-in-laws imaginations continued. Then, husband started imagining why does he have to become separate and that he would only leave the house. A wonderful happy home and family and all living together - one imagination began and everything broke down. Now they are imagining that they are separate and happy and mother is imagining it was tricks and they got separated through tricks. I mention this story because unknowingly we imagine a lot of things but what we really want we do not imagine. When asked to the lady what she wants, she says the happiness of her son and daughter-in-law but her imagination is creating something else. We create, we live through it. Many imagine in advance before doing. Many imagine that a place is unsafe before going there. Why are you imagining that there will be mishap with you and why can't you imagine that all will be good with you. If I go deep into your imagination, then it is illusion and even deeper it is a dream and you are living your dream - the dream that you created, reality is something else. All incidents around you are illusions. The more you imagine the more stronger it becomes and it starts showing as a physical reality. Whatever is your belief system, becomes reality. Someone sneezes and one's work is unsuccessful. It is not the sneeze but your belief system that is the culprit and it is your imagination that has created something negative. I first of all want to clear your myths and superstitions because ShivYog is knowingness. Finish all such imaginations. Human being is known as 'maanav' meaning one who is made of 'mann' (mind) and you all are maanav. Those who have learnt the secrets of the mind will cross the occean (bhavsagar). There are parents and 4-5 kids. I am mentioning to you about "ghar ghar ki kahani" (a famous daily soap) Whatever you imagine how it becomes karmas. During pratiprasav if you long to see the past, there also you will see the same - 'ghar ghar ki kahani'. Whatever sufferings you had created in the imaginations and those which you could not release you carry it to your next life, and then suffers all those experiences, holds on again to the sufferings and says "I am miserable, unlucky." "The world troubles me" "My life is injustified" and thinking all these leaves the body and then goes into another body with all this. All are imagining. A mother who has got her daughter married may be imagining and worrying about her daughter's life there, someone may be imagining her brother troubling her, some may be imagining and blame that there was injustice done, some may be saying that she has ruined her life with her husband.... all these are YOUR IMAGINATIONS. This reality is the fruit of your imagination. All the time mind is in past and future and imagining. Parents must have raised children equally and given equally to their best of ability but if there are five children, all five are imagining differently that someone has got less, which is an illusion. The seed of this injustice was first sowed in the past with imagination. If the same attitude of injustice is carried with imagination all the time, after parents, then will come other persons - like wife or husband who will be imagined as doing injustice and it will be created. Cause and effect. It carries on with the child that "My child is doing injustice to me". At the end of life, when consciousness is inward, that time the inner voice asks "Have you done what you had come to do in this life?" and one will say "I kept imagining all the time about other people's injustice to me and I forgot what I had come to do." My dear ShivYog sadhaks, I am reminding you that you are infinite and the purpose of your taking birth here is to do divine work here and not to suffer. You came here to do something important but you forget with your imaginations and ignorance and create unwanted reality and keep moving in the cycle of birth and death. Babaji here reminded of Sri Shankaracharya's precious words ""Bhaja Govindam Bhaja GovindamGovindam bhaja moodhamathe..." For convenience and understanding i am putting the full reference and its meaning. "Bhaja Govindam Bhaja Govindam, Govindam bhaja moodhamathe, Samprapte Sannihithe kaale, Nahin Nahin rakshati Dukrunkarane" meaning Worship Govinda, Worship Govinda, Worship Govinda. Oh fool ! Rules of Grammar will not save you at the time of your death. Adi Shankaracharya also told the same thing. If you keep looking the world again and again, if you keep judging the world again and again, if you keep searching the faults in the world again and again, then Punarapi jananam punarapi maranam meaning being born again and dying again in the cycle of birth and death. So, link your imaginations to Shiva - Shiva meaning love, forgiveness. You need bhaava not idols because in the name of idols people start begin fighting, killing. Shiva will be found in bhaava. He sits in bhaava. Whatever prayer/puja is done with bhaav, it meets that Shiva. So do not get into showoffs but bhaava. The bhaava of unconditional love, forgiveness, nonjudgement. Bring this bhaava and all the time remain connected in this bhaava. But we do the opposite, my parents have not given me this; my parents have hurt me, hit me; my child has not done seva to me; my wife is bad, she talks rude, she does not take care of me; my husband is bad, he spends time more with his family..... all these are your imaginations and all your repeated imaginations manifest into reality. All incidents happening in your life, any incident, is happening due to your bhaava. The imaginations of your present is held by the imaginations of your past life, which entered at that time into your inner mind (subconscious mind). You have always experienced your outer mind (conscious mind). Your conscious mind functions always in the awake state, sleep state and dream state. All these three states are in the outer mind and only turiya state is in the inner mind. What you experience and imagine all the time with your conscious mind, you forget it but that enters into your subconscious mind. Now, you are not consciously thinking but the thoughts are automatically coming out from your subconscious. Just like when you learn to ride a bicycle, your conscious mind controls how to hold the handle and the peddle and balance. With practice it goes into the subconscious mind, which is very powerful. Eventually, the bicycle now is ridden on it's own without conscious effort even if you are talking. A woman was sad all the time because her mother did not get a good husband. She thought about it so much that when she got married she also did not get a good husband. Then, when she had a child she worried if her child would get a good spouse. In this imagination she created what she feared. I am the creator of my own destiny! Dear ShivYog sadhaks, you have to come out of all these, you have to come out of all these ignorances. Create only one imagination within you - SAT CHIT ANAND. Feel it in your entire body, consciousness, every muscle, cell, head... Don't just say this.. feel it.. the same way you feel totally and say "That person ruined my life!" Same way feel the SAT CHIT ANAND.. Feel in your head, eyes, ears, neck, shoulders, all over your body. In Sanatan there are many granths in which there are many secrets of life hidden. While I was in Karnataka (South India) in ancient temples there are ancient manuscripts kept there and westerners have provided some scanners to the people there to scan and send it to them. They are trying to recreate the partially destroyed scripts. The information is going to the west. You may be surprised to know that Space Science is also there in the scripts and so is medical science, quantum physics, sound (mantra shakti) and all the wisdom in it. The secrets of the Universe is there in the ancient scriptures. We read it only religiously but do not go deeper into it. It is my wish to make you experience the wisdom of Upanishads, Gita, and other scriptures. According to our belief system, it is possible that there could have been a vested interest in creating superstitions due to which we could not go deeper. I feel this is our shortfall because if the saints would have given this to the world, then today the world would not have been diseased, unsuccessful and helpless. So, I am trying to make an effort to give you all this wisdom for you to absorb in your lives and make your lives bright. Your hold on life should be such that however you want your life, you should be able to create it in that way. When people are on deathbed, there is usually chaos around - pandit is called, Garud puran is read, wisdom of Gita is read out and also it is said that a granth is "touch-me-not" stating it is wrong. I have even heard people saying not to keep Garud Puran in the home since it is inauspicious. All these are superstitions. How can the wisdom that is being given to a man at the time of death be bad? It is the ultimate truth. The Purans have been somewhat adulterated and it could have been done with some vested selfish gain. But if you ignore the adulteration and read and meditate on the Puran then you can get a lot of wisdom. I wish that you have the wisdom of Garud Puran. Garud who is the avatar of Narayan and vehicle of God, was instructed by the Lord on the ultimate truth. Death is a state in which the past and future merges into the present and this is the same state where God says, "Hey maanav, you are the Sat-Chit-Anand soul, you are the one who was never born and you cannot die." But one goes far away from the ultimate truth when one takes the form of body and becomes body conscious all the imaginations of the past and imaginations of the doubts of the future. It is the law of nature that whoever has come has to go but you have to let it go otherwise how can it go? it is very important to let go of every incident which comes in your life. Your awareness should shift from body consciousness to soul consciousness. When man forgets this and becomes body conscious, then only there will be suffering. All these are the states of mind. There are people in all religions and in all religions one thing is true that when a person is about to die, he/she either sees pitrus (dead relatives) or they start seeing their God. If a Vaishnav, he will see Krishna, if Shiva bhakt then will see Shiva, if a worshiper of Shakti, will see Devi Bhagwathi. If a Christian, will see Jesus Christ. If a muslim will see peer/paigambar (prophets) and if Buddhist will see Buddha. So are all these different? It is an inward journey till one gets born. After birth it is said not to disturb the newborn child because he is connected with God and with his past life, so even a name is not given till then. Then slowly one starts teaching it 'Twinkle twinkle little star' and introduced to mother, father, uncle, aunty - the outward connections. The three aspects of soul - Janm (birth), jeevan (life) and mruthyu (death). Every moment these three aspects are happening in your life. Death is not what you fearful idea that you have but it is going back to the inward journey, inner consciousness. Whatever you had spread in the outer consciousness, bring it to the inner consciousness. This is a state which is called the state of sadhana - samadhi. The art of shrinking and withdrawing the consciousness from external world to the internal word and bringing it to one-pointedness within where the Lord dwells, is the process of sadhana. And if you able to stay in this state for a long time then that is the state of samadhi. Man keeps living all the life with external consciousness, projecting his imaginations externally and being stuck with it. This is my relative, this is my wealth, this is my belonging, this is my business, this is my name, this is my status... stuck in external consciousness. If he does not come within, then during the time of death a moment comes when nature does this work of withdrawing the consciousness from external to internal. Whatever the man has seen and believed with his external (conscious) mind has now gone into his subconscious mind. So, now in his imagination there are only relatives and relatives, then pitrus get transfered within. There are women who do so much of seva that sometimes I feel that they should ask from me something but when they ask they ask about pitrus, relatives... requesting to make their so-and-so alright, they fail to see what is their soul agenda and what is their karmas. How can I give? What not can I give you? But they are stuck asking for others; you take first. This is what I wish, stop the attachments. Keep helping, keep praying but no attachments. Because if you have attachments then during the last moments whatever you have put within into your inner mind, they will start coming up. This is why man sees their own Gods and deities according to their own belief system. My guru said "You do not live in the Universe but he Universe lives in you." Heaven and hell is within you, all the lokas are within you. All is within you and nothing is out. In last moments this inward journey begins. A siddha merges the mind into the soul and unless this is done, mind will exist. Body is left behind but mind is alive, body is left behind but the subtle body is alive. Whatever you have stored in your mind, that is what you are going to see. So I say detach! Now do not worship the troubles of others but worship on the Divine. Worship your real self. If you meditate and master the real meaning of the song "I am not this body" you will destroy your sanchit karmas within moments and get liberated. The one who practices daily the Art of Dying sadhana, doubts will cease to exist in his mind. There will be no suffering within him because while living itself he will learn that there is nothing called the death, that he was alive before getting this body, alive while in the body and will be there even after leaving the body. From this physical body from whichever door you leave, you will enter into that dimension. You have 10 doors in your physical body. At the moment of death 9 doors shut close and one door opens. According to your karmas, thoughts and tendencies that particular door opens and from there you leave your body. This body is a vehicle, a chariot in which your soul is travelling in the journey of "nar se narayan". You are on and often given the opportunities to start your inner journey. You get unsuccessful and the chariot breaks down or becomes weak, you wander your awareness here and there, and finally when the chariot breaks down God is so loving that you are given another chariot to continue the journey to your destination. Let me remind you the purpose of you taking birth - to finish the journey in this life that you have not been able to complete since so many births. The chariot that you have got, preserve it well till your final destination what is called as the FINAL ASCENSION... achieve it. This is your ultimate goal. The other goal is to destroy all our ignorances and darkness of suffering. Andhakaar timir-andasya, gyanan-jana shalakaya, chaksurun-militam yena, tasmai sri-guruve namah... The guru who destroys the darkness within me and light the lamp of wisdom within me, hey Gurudev, I bow to you. Bless me. The moment the darkness is destroyed, the sufferings are destroyed. You will attain peace. Life will become happy and at that time every moment of life will be a celebration. Till you are on earth, you will remain in bliss and after that with your wisdom start/continue your journey and finish your journey here and merge into the param tatwa (infinite). A ShivYogi everyday keeps withdrawing his senses/consciousness within and all the sadhanas that you are doing to release your karmas and purify, in reality you are doing the Art of Dying sadhana. Till now you were doing everything in ignorance and unconsciousness, ShivYog is knowingness. Every step you take be aware not to place it on the path of darkness. "Hey gurudev, Hey Shiva, every step I take let it be on the path of light. Even by ignorance let me not fall off the path. Hey Paramatma, if you have to bless me, bless with with this. Stop me whenever I walk towards darkness. Help me move only towards light and bless me to purify my mind every moment, every moment wash away the impurities of my mind." The fives senses are the fives horses of the chariot and mind is the charioteer. If the charioteer wanders, the horses wander. In scriptures it is mentioned what happens while the soul leaves the body. You have five bodies and during sadhana you must become aware of the five bodies and how to purify them. During this time, the external consciousness withdraws into the inner consciousness. A person who is calm and silent pulls this consciousness within. This is why it is said that one has to do sadhana right from childhood. People say that they will do in old age because there will be lot of time then. We never ever say that we will eat food when old age comes or have bath in old age or marry in old age since I have a busy life. Sadhana is a part of life. Every morning practice in sadhana to withdraw your senses because when you go out for the day the consciousness is turned out and there are lot of things happening in the outer world according to other's soul agenda and if you do not do sadhana you will get stuck with those people or incidents. When a person who is stuck so much in external things reaches his final moments, then he will enquire where is Pappu and where is Lallu. Call him at once. One old person whose all organs collapsed was asked to be kept on the ventilator because after 21 days there was a marriage and let him see the marriage and go. This is when you think that everything is over when the physical body is over. In reality, with physical end nothing ends. The "I" that is left after this can create another body. The ripened fruit has detached from the tree but doctors have tied him with the chords of the ventilator. If this chord breaks the marriage will get broken. How selfish people are! What is nonvoilence? It is not to hurt anyone and it also means one who is going should not be stopped. This is the biggest violence to stop someone who is leaving because you are doing opposite to nature. It is violence to kill a living person and to not allow a dead person to go. Why can't the marriage be preponed 21 days. In the meantime, someone told the man on the ventilator that his daughter-in-law is talking to Babaji and may be to get rid of you he gets alarmed. The couples go to meet the dying man and the boy greets and the old man struggles to hug him and when the girl greeted him, he immediately moved his face away! So much of holding when the chariot is broken and not a single step can be taken, still so much of ignorance. It is a pitiful state in hospitals where people are kept hanging on ventilators to see marriages, etc. If you let the person go, he can still witness the marriage in this subtle body. All these things have been experienced that when one has left the body, he has seen his body lying there, sees his people crying over his body. If he is one who is attached to the worldly things, he keeps a watch to see if his body is cremated properly or not. And, if the people are being stingy in the rites, he even becomes sad and grumbles that inspite of leaving such wealth behind, people are betraying him. All that is there in his inner mind is alive. All the imaginations that he carried in life is active now. Conscious mind is dead but subconscious mind is still alive. Once when I was in Mumbai, there was a chaos when one person in the society got paralysis. I requested sadhaks to go and do healing. They did and after one hour he got life in his body and he asked that he wanted to see who is Babaji. They brought him slowly walking to me. There was sadness written all over his face. I asked him why is he not happy when he is alright now? He replied how could he be happy when he had worthless sons. I asked him what did they do and he replied that he was sure that when he would die they would not do shraadh (a ritual done with respect for reverence and gratitude of the dead). So much of attachment stuck on his sons and he is alive and imagining that his death rituals will not be done!! So, who are worried suffer later also. One person said that he wanted a child. I asked if he does not have children and he said that had three girls. I said then you have children, be happy. He grunted saying he does not have a son. I asked is this a hotel menu card that idli has come and now need a vada. I asked why son and he replied that after his death his son only will give life to his soul (by lighting his pyre). I said if you become lifeless here itself even Apollo hospital will not be able to give you life, forget about the son. All this is superstition and ignorance. There is nothing like this. Only you can give life to your soul; only your karmas can. To read part 2 click here. To read part 3 click here. To read part 4 click here. To read part 5 click here. To read our entire tour with pictures click here. Let us always offer deep gratitude to our Guru for making us known such precious wisdom through so many resources with such ease and accessibility. Thank u Jacob bhai, I felt as if I m present at d shivir site....listening...with full attention...God bless u,,namah shivay. Thanks a lot for sharing...you have mentuioned each word as mentioned by the Babaji in the Shivir....very nice....keep posting. thank you for your comments friends.. gratitude to Babaji for this platform.. stay blessed with his grace! namah shivaya..
Jacob,the blog and information is really AWESOME ! From some link, I got to know your name after hearing your voice for the bhajan "Jyot se Jyot Jagao"...God Bless You. ! Namah Shivayah ! Namah Shivaya Jacob ji. I wanted to Thank You with all my heart as your websites, writings siddha places and the teachings of our Babaji have really helped me to spend my leisure time in the best way possible and hence receiving the grace of our Guru and Sadhgurus even when reading about their Leelas. Namah Shivaya and May god bless you. Everything here only by the inspiration and grace from Babaji. Freely use all contents anywhere, but please put the reference of this website name "www.divinetouches.in" so that the complete version of the material can be referred to by readers because sharing in bits and pieces can alter the entire meaning of the content. Hence, kindly do not modify, edit, or change any content or material of this website while using it anywhere. This is to preserve the right interpretation and authenticity of the articles to the reader. Please avoid plagiarism. Thank you. Namah Shivaya. Alll rights reserved - www.divinetouches.in . Theme images by A330Pilot. Powered by Blogger.